It seems like the rest of the NFL's players respect what a player Tom Brady is, even if the NFL would rather see him banned. In the Patriots final pre-season game, a future great exchanged jersey's with a great of the game when Odell Beckham Jr. swapped with Brady in a show of respect. Now another a fellow quarterback wants Brady's jersey. Ben Roethlisberger. 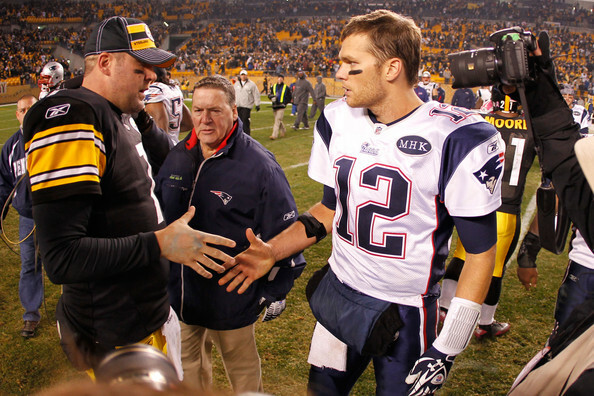 The Steelers' stalwart and Brady were in conversation before the game on Sunday which was caught on camera for Showtime's Inside the NFL program, talking about exchanging jerseys. "Good to see you, man," Brady says to Roethlisberger as the two share an embrace. "How are you doing?" Roethlisberger asks before relaying how badly he wants to play against him. "Vice versa, I feel the same way," Brady says. Then Roethlisberger puts his hand on Brady's chest and says, "Hey, listen, I've never done this before but I would love to get a jersey at some point. It would mean ... There's not many that I want. I'm going to put it in my office. You're the best, dude." Brady was happy to oblige to his great rival and said he will give it to him after the game. They had a final embrace to each other before they headed to their respected sidelines. This is a great example of two of the great quarterbacks of the last decade acknowledging each others success.